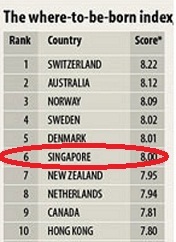 A recent survey conducted by Gallup concluded that Singaporeans ranks as the most emotionless society in the world. Participants were asked whether they experienced five positive and five negative emotions a lot during the course of a day. - We are often unappreciative of things people go out of the way to do for us. This lack of social expression and cohesion is often attributed to our lightning paced lifestyle where people constantly struggle to fulfill their career, family, financial demands. In fact, Singaporeans have grown so accustomed to it that when we see a 70 year old hatchback toilet cleaner at MRT stations, doing physically demeaning tasks, we do not even twitch an eyebrow. Our hearts have hardened to such an extent. This is in direct contrast to a " where to be born in 2013 index" where Singapore ranked 6 overall for newborns to have opportunities to enjoy a safe, healthy and prosperous life. So the question is: Is it really such a good idea to pop babies in Singapore to endure 18 years of vigorous education and grow up to be working adults who just couldn't care less? So how did we collectively reach this stage where despite our economic success, we rank low in basically everything that "makes life worth living" ? Where we become rich in material possessions but poor in our social connections with our fellow countryman? 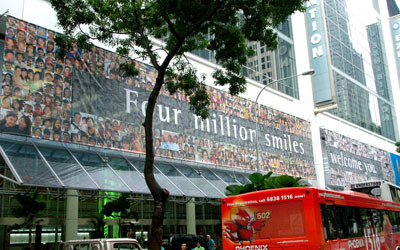 From a financial perspective, there are many driving forces which led to this " emotionless" state within Singaporeans. Many prominent economists and social psychologists have discovered that many indicators that measure social well being e.g. how happy a child is, the level of trust within a community, level of social mobility has a strong correlation with the extent of income inequality within a country. Recent studies have shown that the top 20% in our society is 10 times richer than our bottom 20%. 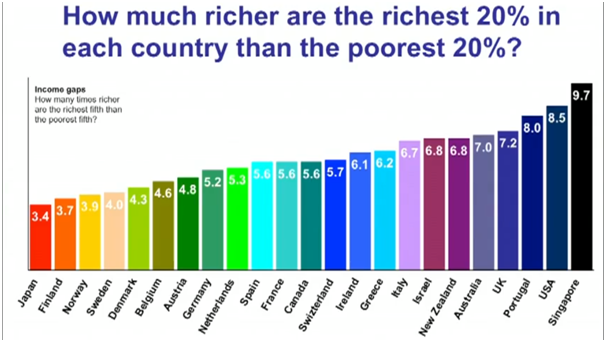 (This is twice the inequality of other developed nations like Japan, Finland & Norway). The large contrast between our rich and poor and our constant need for social validity has been pulling us further and further apart. It seems like in Singapore, one really have to get rich, or die trying just to make ends meet. It would be interesting to observe how "emotionless" Singaporeans can evolve in years to come as the trend seems set to continue. At the meantime, perhaps we could show more emotions by enjoying a good laugh, at least at ourselves. I would think if any, Singaporeans can be less expressive than others. We do generally find it hard to express ourselves in this stressful and mind-your-business society. However we are definitely not emotionless! In many forums & blogs, many S'poreans are actually quite opinionated about how they feel towards certain issues/incidents and are unafraid to show their emotions. I guess we are just more expressive behind our keyboards. If Gallup has a survey on which society complains the most, i think we will probably come out tops as well.